Research in Motion is no more. The company has ditched the ailing brand and decided its future is as BlackBerry. But a name change alone would not be enough to drag the mobile manufacturer out of the depths it had descended – with plummeting profits, falling market share and its reputation as the first choice of business smartphone almost in tatters. Enter BlackBerry 10, the company’s brand new mobile operating system (OS), which it hopes will entice back the enterprise customers it lost along the way to Apple and Google, as well as lure some new ones on board. What has always been the big appeal of BlackBerry is security. While horror stories have been published left, right and centre about other mobile platforms, the way BlackBerry handsets can be controlled by the IT department through the BlackBerry Enterprise Server (BES) has done well to keep the baddies away from the corporate network and allowed employees to work securely on the move. But with the emergence of bring your own device (BYOD) and the desire of workers to have an all-singing, all-dancing consumer handset that works in the office as well, the almost retro-looking BlackBerry handsets lost out. With the launch of the new software yesterday, BlackBerry introduced its first touchscreen handset, the Z10. Aesthetically, it can easily sit on the shelves alongside the iPhone or Samsung Galaxy range, but thanks to the software it offers more. BlackBerry Balance, a feature of the new OS, enables a user to have two homescreens; one for personal and one for work. The professional profile can be controlled by the IT department, enabling a company to have its own app store with specifically approved software for download and keeping consumer apps that could pose a threat away from the corporate network. However, in a swipe of a finger, the user can return to their personal profile and have everything they want at their fingertips, negating the need for two separate devices. Jim Somers, chief marketing and strategy officer at mobile software firm Antenna, praised the introduction. “Making a secure ‘business’ container – via their work perimeter and BlackBerry Balance – a fundamental part of the operating system is a smart and daring move and one that is likely to pay dividends with businesses that want to maintain strict control over their data and give their employees a device with a cool factor approaching that of the iPhone,” said Somers. If it appeals to the consumer and they want to buy the device themselves, but also has the ability to be secured by the IT department without them having to pay for the handset, it could offer those like Staffordshire Council the right balance of what they need. “We are actually piloting a BYOD solution at the moment so, when that is proven to be robust, we could potentially see our corporate smartphone population dramatically reduce,” added Falcus. “At this moment in time personally – and I’m sure I’m not unique – I carry around a business phone and my private phone, which I pay for unlimited data, calls and texts, so if I could, without compromise to my own device, use a BYOD application then I would save the council money and save wear and tear on my trouser pockets,” Falcus said. Details of integration with existing BES deployments remain scarce but no enterprise environment belongs to just one handset manufacturer anymore. If BlackBerry still wants to play in the game, it will have to offer its extra security to devices from other ecosystems as well. David Wilde, CIO for Essex County Council, tweeted positively about BlackBerry 10 after yesterday’s launch, but told Computer Weekly: “[It’s] too early to say about what it will actually do, but the promise seems to be around being able to service and support devices on multiple platforms securely and segregate personal and multi-organisation channels and apps. Be it a business purchase or a consumer upgrade, it is clear this isn’t a device everyone would necessarily be able to afford. The pricing that has been announced so far is at the very high-end and, on Vodafone, for example, you can get a Samsung Galaxy SIII for almost £10 cheaper every month than the BlackBerry Z10. “It’s unrealistic for handset manufacturers to continue to think they can create new more advanced devices that cost the same as a PC or laptop, and then expect the mobile networks, or the providers to fund these gratis,” said Jason Yeomans, managing director of mobile managed services PMGC Technology Group. Will it prove to be user-friendly? Also, with a new platform and entirely alien gestures, it is still yet to be established whether it will have the ease of use that won so many customers over to iOS and Android. Stephen Timms, shadow minister for employment and Labour MP for East Ham, got a sneak peak at BlackBerry 10 before launch and had mixed feelings. 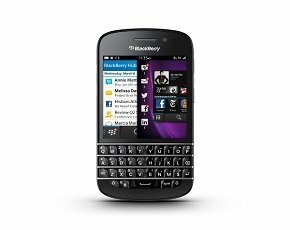 There is no doubt BlackBerry has the enterprise user base in mind when designing BlackBerry 10 and thought about the desire for BYOD with its Z10 handset. The reviews have been mixed so far from the IT managers we have spoken to but, if the integration with existing BES deployments is announced and the Balance feature of the software is as smooth as the firm says it is, BlackBerry could be onto a winner. But convincing the IT department is one thing, now it is time to convince the users too. “Without that consumer appeal, BlackBerry’s ability to re-break the workplace may also be in doubt – especially as the number of firms actively issuing devices to their workers is decreasing all the time,” concluded Somers.